Get ready to run for your school…this year’s Boosterthon fundraiser kicks off next Monday, February 25th! 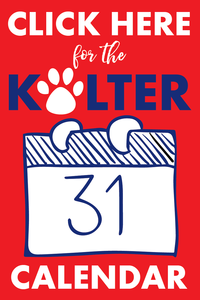 The 2-week event will start with a pep rally for the students on February 25 and ends with the Kolter Bolt Fun Run on March 8. To participate, you need to log in to funrun.com where you and your student can gather pledges for every lap they will run at the fun run (with a 35-lap maximum). Your student will earn prizes each morning based on the pledges they’ve received. Our goal is to raise $45,000, so please help our school by reaching out to your family and friends for pledges. Thank you for your support! It’s a date! Buy your tickets today for the annual Parent / Child Dance event on Saturday, February 2nd from 6 – 8 pm. Tickets are just $5 per person and it will be a night your whole family will remember. Mark your calendars for our annual gala and auction event to be held January 26, 2019 at Braeburn Country Club. See all the details on the Gala / Auction page. If you or your company wish to contribute an item for the auction, the committee is currently accepting donations. Join the unicorns, gnomes, and other enchanted creatures for the Kolter Book Fair on Thursday, November 15! We need volunteers throughout the day to help with setup, class shopping, and other tasks. Visit the Book Fair page to sign-up as a volunteer. We had record attendance of over 300 people who all enjoyed food from the Chik Fil A food truck, a movie, the Astros game and more running and playing than you can imagine. The kids (and parents) all had a night to remember. Watch this space for announcements for the next Kolter Campout.